In the photo above you can clearly see the outline of where a sheet of cardboard had been left for a few weeks. The sheet was dry for most of the time but did get a soaking recently (which is when I moved it to the compost pile). See how the concrete that was protected by the cardboard is cleaner than the surrounding parts? I'm thinking that this darkening is due to mold, not to soil or other dirt. The places where several nursery pots were kept are cleaner than the surroundings again. Surely if this were just dirt then the leaking soil from the nursery pot drainage holes would have stained the ground -- but you can see that's not the case! 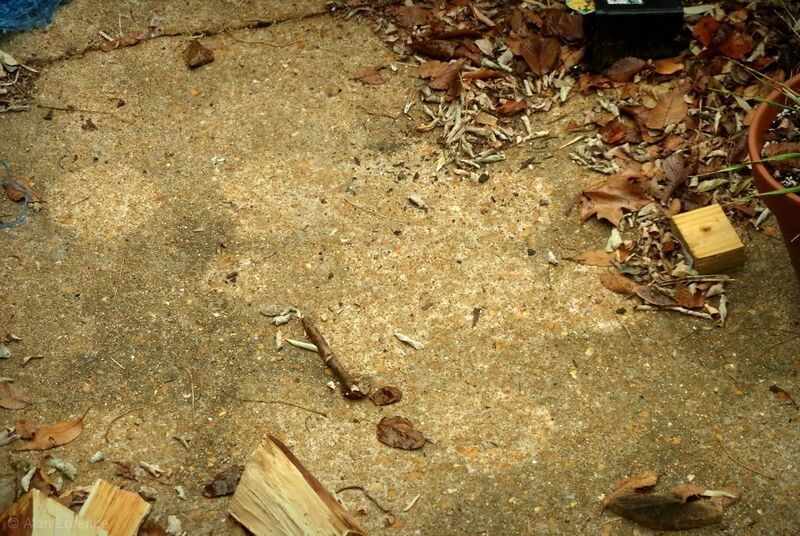 I was also thinking that perhaps this is due to tannins from fallen leaves -- they could darken the driveway easily. But then I remembered my blower-obsessed neighbor who has the cleanest driveway on the street -- she power washed the driveway during the summer and remarked at how dirty it gets every year. I assume she was talking about this darkening from mold. The composite boards are notorious for getting those dark mold spots. 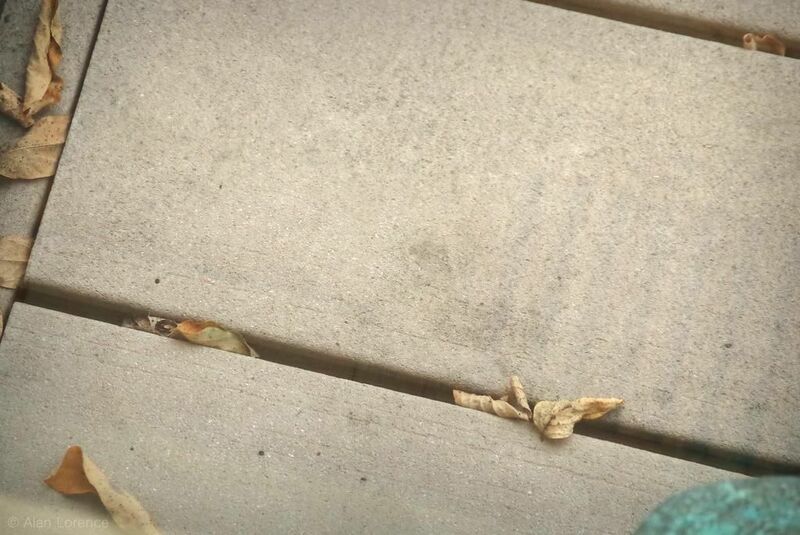 I power washed the deck at the start of summer, so this is at most four months of buildup. Blech. ...show much less darkening and no spotting. (In that photo, the closer to the bottom of the image the closer to the house). 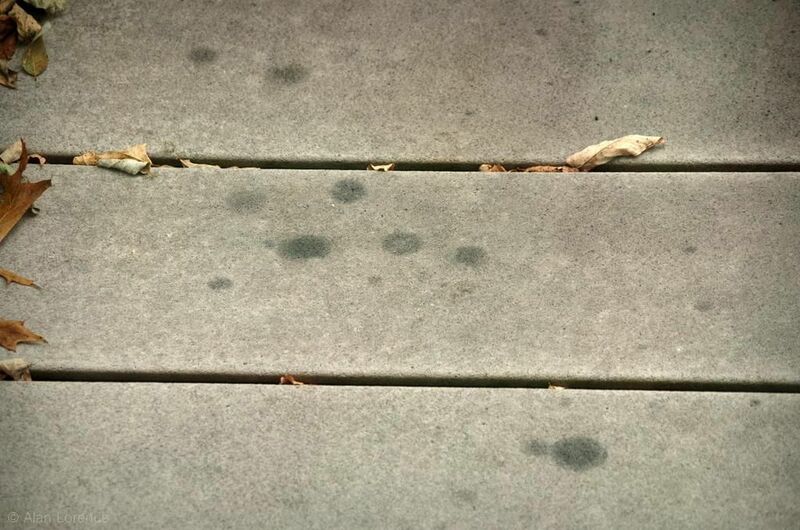 We had a period of many weeks with no rain this summer, and that didn't stop the deck mold from forming -- it can't be dryness that keeps those areas relatively clean, can it? So I have to conclude that the mold spores are falling from the skies, or are at least in the air that's circulating everywhere. Is that the right conclusion? Thanks autumn -- my allergies thank you too! 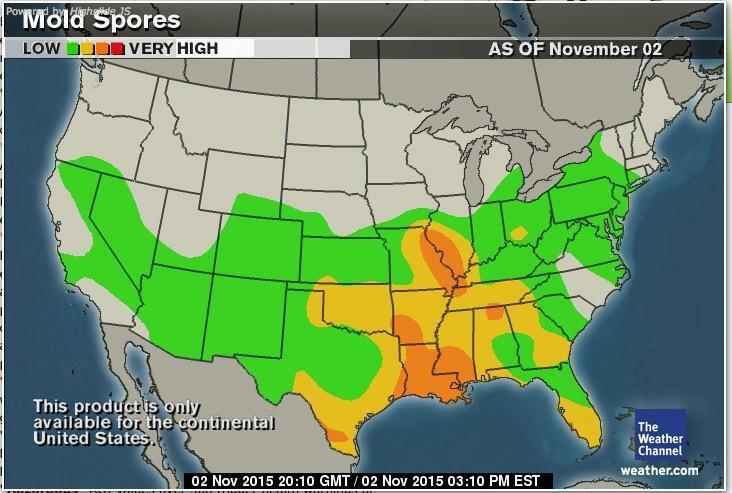 Mold spores are in the air everywhere. 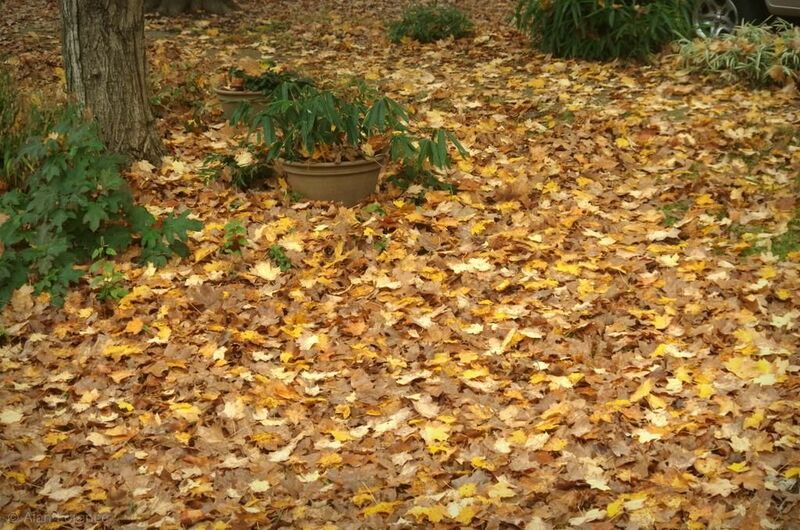 Leaf mold is awful. I don't know what can protect things from mold aside from moving air that can reduce its chances of growing. I think air pollution also darkens concrete and stone. 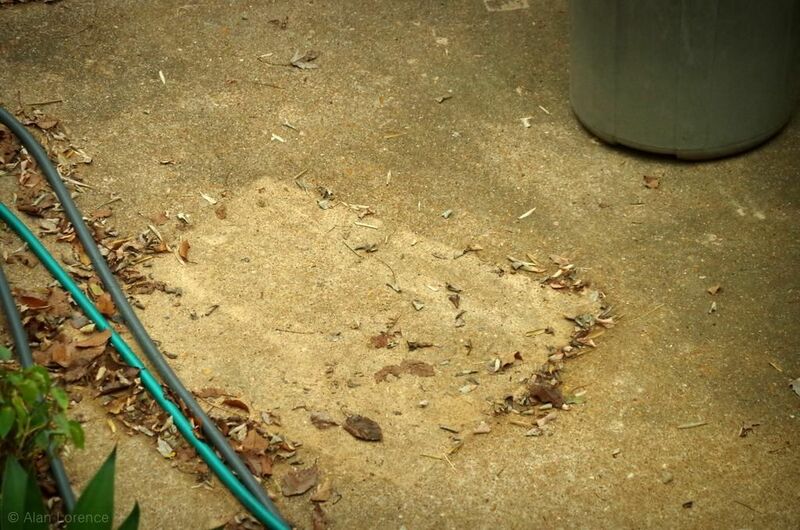 Yikes, I predict more pressure washing is in your near future! Mold. Eeewww. Glad to see the graphic that shows little to no mold count in Seattle--not that it doesn't exist...but not like you've got it, at least. You could simply embrace it and make a mold garden. Mold has to live somewhere! Your house seems like a good option. Maywyn: not sure why the deck under the eaves is cleaner then. Emily: That map always depresses me. Why did I end up in one of the mold hotspots of the country? Lisa: NIMBY doesn't work with Nature, does it?